The diets of fish run the gamut from strictly herbivorous to entirely carnivorous. A good number of pet fish are carnivores or omnivores. Those who are herbivores are often kept for the purpose of cleaning algae. This is why most fish foods available contain dehydrated fish or insects. Some of the most colorful fish, like these discus, are meat eaters. Bettas and tetras are two great carnivorous fish for beginners. 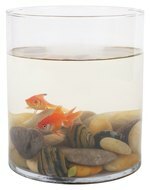 They are both small enough that they won't need large tanks, and neither require a lot of special attention. Oscars are also good for beginners, but require a little more attention. Bettas, or Siamese fighting fish, are colorful and energetic. They rarely get longer than 3 inches, and can be kept in a tank as small as 3 gallons. Betta males can be aggressive with each other, but females do well as long as the fish they are housed with do not provoke them. Tetras are small, slim fish who max out around 2 inches long. They are social fish that do well in schools of other tetras or similar small fish. In fact, they are so social that professionals recommend keeping them in schools of 10 or more. Oscars are a popular fish with people that want to bond with their pet. They have a lot of personality, are often curious about their surroundings outside the aquarium, and can learn to enjoy being petted. The Oscar is a large cichlid that is easy to keep and will gladly eat small fish, shrimp and worms. Piranha look great, but they are not cuddly pets. Some fish are so aggressive and predatory that it's best they live alone, but they can make great pets. Among these are the red-bellied piranha, the arowana and the puffer fish. The red-bellied piranha is attractive and impressive, but its aggressive nature makes it a poor choice for a communal aquarium. This fish should be handled carefully, and only when necessary. Though best kept alone, piranha can do well in groups of other piranha. Arowana are large pets that you can expect to form a lasting bond with. They can live up to 20 years and reach a length of nearly 4 feet, though aquarium specimens rarely exceed 30 inches. 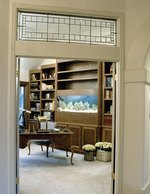 As adults, they prefer to be alone and will need room to swim, up to a 300 gallon aquarium. Arowana are great jumpers, so you will need a firm lid on your tank. They can be taught to take food from your fingers, but watch out, these intimidating fish have teeth almost everywhere in their mouth, including on their tongue. Like the arowana, puffer fish prefer to be alone. They come in a wide variety of colors and patterns, and can vary in size from as small as an inch to as long as 3 feet, depending on species. It is especially important not to house them with other carnivorous species, as they are highly toxic to most predators. Certain social fish need a group dynamic for the sake of their health. Tetras, as mentioned, benefit from a group of 10 or more. Discus and clown loach also prefer some friends to interact with. Discus are colorful fish with a complex social structure. They can be playful and love to live in groups with other discus. Discus are not large. You can expect them to reach between 5 and 6 inches. Loaches are not difficult to keep, and their energy and social nature make them fun for new aquarists. A clown loach can get up to a foot long, and if you see it lounging about on its side or back, don't jump to any conclusions. After it has used up all of its energy, it is normal for a loach to lie about and rest. Some fish, like butterfly fish and brown-banded bamboo sharks, are a little more difficult to keep, but are such great conversation pieces that aquarists put in the effort. The living fossil known as the butterfly fish is a surface gliding predator who has remained unchanged for millions of years. It does not get large, but requires a large tank to accommodate its surface hunting habits. And it will need to hunt. Butterfly fish need live food as the majority of their diet. Like the arowana, butterfly fish are skilled jumpers, so make sure the lid on your aquarium is good. The brown-banded bamboo shark also requires a very large tank. It reaches a length of 40 inches, and will want at least 150 gallons to swim around in. Other than demanding a large aquarium, this fish is one of the easiest sharks to keep, and will eat pieces of fish or small, live fish. It also will do well with other fish, as long as they are too big for it to mistake for food.